Based on a 2002 paper by Chuang et al., I'm trying to understand the math for calculating 'drop-cutter' toolpaths (Julian Todd also has a lot to say about the drop-cutter approach). The basic idea is that the x,y position of the cutter is known, and it is dropped down along the z-axis until it touches a triangulated surface. 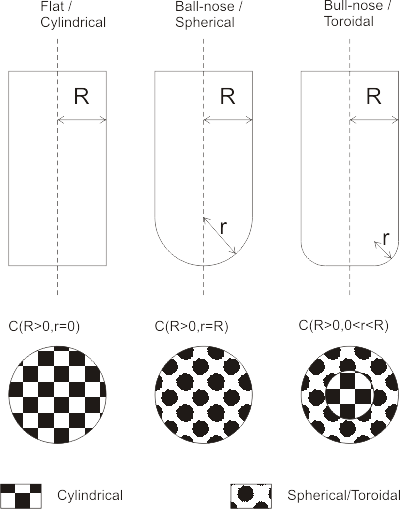 A complex surface is built up of many many small triangles, but the algorithm stays the same. For each triangle there are seven items the cutter might be touching: three vertices, three edges, and one facet (the triangle surface). 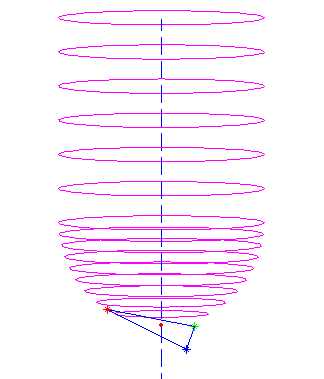 It looks like a contact point with a vertex is the easiest to calculate, so I'm starting with that. I'm hoping to post part 2/3 and 3/3 of this post soon. They will deal with the facet and the edges. Here's how I think no 1 and 2 work. Assume the vertex we are testing against is at (x, y, z) and say the cutter is at location xe,ye. 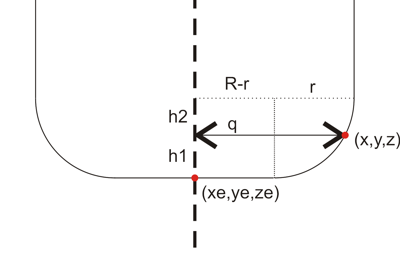 We are looking for the cutter z-coordinate ze so at the end when the cutter is in contact with the vertex it will be located at (xe, ye, ze) . Now if q > R the vertex lies outside the cutter and we should report an error or just skip to the next triangle/vertex. here a ball-nose cutter is dropped down along the dashed line into contact with all three vertices (red, blue, and green stars), and finally it's positioned at the highest ze found (red dot). Well, that was easy. Now onto the facet and edge tests!